In addition to artifact loans, traveling exhibitions, and speaker programs, Smithsonian Affiliations collaborates with Affiliate partners to bring engaging educational programs to local communities. Reaching young learners and families is a Smithsonian outreach goal, one which Smithsonian Affiliations proudly helps facilitate through our Affiliate network. Whether astrophotography, invention, documentary filmmaking, or citizen science, Affiliate educational programs spark wonder and ignite curiosity for learners of all ages. Explore the current educational initiatives on these pages and view the main calendar of events in Affiliateland. 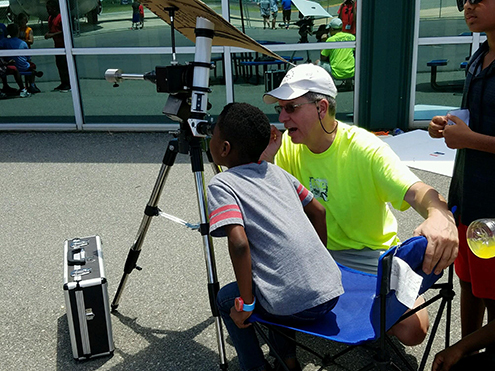 A student participates in a Youth Capture the Colorful Cosmos astrophotography program at the Carolinas Aviation Museum (Charlotte, NC). The program is in collaboration with the Harvard-Smithsonian Astrophysical Observatory. Photo credit: Carolinas Aviation Museum.